(left) Ronald Cheng and Stephy Tang get happy, and (right) Cheng does the kung-fu thing. The Skinny: Throwaway and inconsistent, this surprise comedy hit is also occasionally funny, though the frequency and degree of hilarity cannot be predicted. Ronald Cheng shows comic charisma, and the whole thing can be disposable funif any of this means anything to you. It's possible that most of the Western world couldn't care less. by Kozo: Hong Kong has a new comedy hero! Sort of. After Ronald Cheng surprised most audiences with his effectively wacky turn in the 2003 Lunar New Year Comedy My Lucky Star, he was handpicked by director Vincent Kok to headline his own comedy. The resulting epic, Dragon Loaded 2003, seems cut from the same cloth as too many eighties and nineties HK comedies. What that means is the film is messy, formulaic, and without any consequence whatsoever. However, it's also sporadically funny and inspired, and Ronald Cheng is a likable comedy lead. Dragon Loaded 2003 will never be a classic and it doesn't deserve to be either. But for throwaway laughs, it can occasionally do the job. Cheng is Lung, a spoiled rich brat who claims to have a sense of justice. That's all well and good, but instead of spending his time doing good, he hangs around all day with his spoiled rich friends Sam Lee and Cheung Tat-Ming: The lazy attitudes of the spoiled rich trio annoy their fathers, who proffer a bargain. If the three can become worthy cops then they'll allow them to inherit their fortunes. Otherwise, the three old geezers will hand out all their money to passerbys at the Jordan MTR station. It looks like it's time for Lung and pals to join the police squad, which means lots of wacky Police Academy-type shtick as the three attempt to better themselves. Or not. Despite the threat of losing their fortunes, the three buddies seem to have no desire to remain on the force, and make getting kicked out their primary goal. But Lung is not getting kicked off the force. It seems that his dad (Law Kar-Ying) was once pals with Chief-Of-Police Uncle Ting (Eric Tsang), who won't let the cadet school simply can Lung. In fact, Lung gets promoted to a special "Police Intern" position, along with his two buddies and the adorable Man Ching (Stephy Tang of the Cookies), who's called Stephy in the subtitles (duh). Lung's new intern position allows him the opportunity to simply follow Man Ching around like a chatty moron, making lame conversation and basically doing anything but enforce the law. This waste of screen time and taxpayer money occurs despite the fact that Lung has sworn to be a good cop, a vow induced by Man Ching's lifelong desire to be a policewoman. There's the plot development: Lung wants to be a good cop because Man Ching wants to be one, too. But, he wastes time and effort acting like a complete idiot on the job, all in front of Man Ching, who he's supposedly trying to impress. And, rival cop Zhi (Ken Cheung) hates Lung, then starts to like him, then seemingly hates him again. And don't get started with Lung's pop, who behaves as consistently as the quality of Ekin Cheng's filmography. Basically, nothing here makes any sense. Then again, is that anything new? Dragon Loaded 2003 was brought to us by Vincent Kok, a writer/director who once upon a time served up silliness in the service of charming formulaic plots (Only Fools Fall in Love) or fleeting rites of youth (Cause We Are So Young). Nowadays, it seems that Kok is angling for the "new Wong Jing" crown, which can be deduced by his earnestly cheesy scripts for both this film and his Lunar New Year "comedy" My Lucky Star. Nothing about either film makes much sense, and any and all emotion manufactured for the screen is just that: manufactured. As such, it's as affecting as a Gap commercial, and as fresh as week-old donuts. To wit: don't check out this film for real, honest-to-goodness filmmaking. Dragon Loaded 2003 is the cinematic equivalent of cramming before the big test. Basically, you put everything into one caffeine-supported burst of effort, all in the hopes that it'll turn out okay. Well, in truth, it didn't turn out that badly. While Dragon Loaded 2003 has a plot that couldn't pass muster for a Naked Gun movie, and some bursts of "comedy" that are just plain non-funny, there are also some small moments of amusement that nearly redeem things. 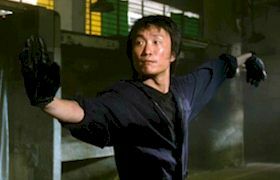 Some minor bits (Lung's Matrix kung-fu parody, and his solution to a hostage crisis) manage to be surprisingly funny, and at the very least Dragon Loaded 2003 is not interminably boring. The supporting cast has their moments: Stephy Tang is photogenically vapid, Sam Lee and Cheung Tat-Ming are dependably amusing, and cameos by Miriam Yeung and Jacky Cheung prove to be highlights rather than distractions. Also, overacting bit player Jim Chim Sui-Man is funny as a cartoonishly sleazy bad guy. There's even some brief kung-fu for those who give a damn. For Hong Kong-specific audiences, Dragon Loaded 2003 easily delivers the goods. But that's the big caveat: the film is amusing for Hong Kong-specific audiences, and probably few others. This isn't to say that the wacky work of Johnnie To or Wong Jing is necessarily more suitable for Western audiences, but Dragon Loaded 2003 is probably more suited to shrimp chip-eating theatergoers than your average HK comedy hit. Aside from the numerous cultural references (the July 1st demonstrations, parodies of HK TV shows), the film stars Ronald Cheng, who isn't exactly a big name to Western audiences. His showing here has its occasional pitfalls (Cheng dancing in a stuffed leotard? Nooooooo! ), but he's already invoked the title of "Stephen Chow replacement" in many a Hong Kong publication. Cheng is now looked upon as HK's comedy hopeful, and it's entirely possible that he could get there. He's self-deprecating, not a prettyboy, certainly not vain, and likable enough IF he chooses the correct roles. And yes, he's funny.